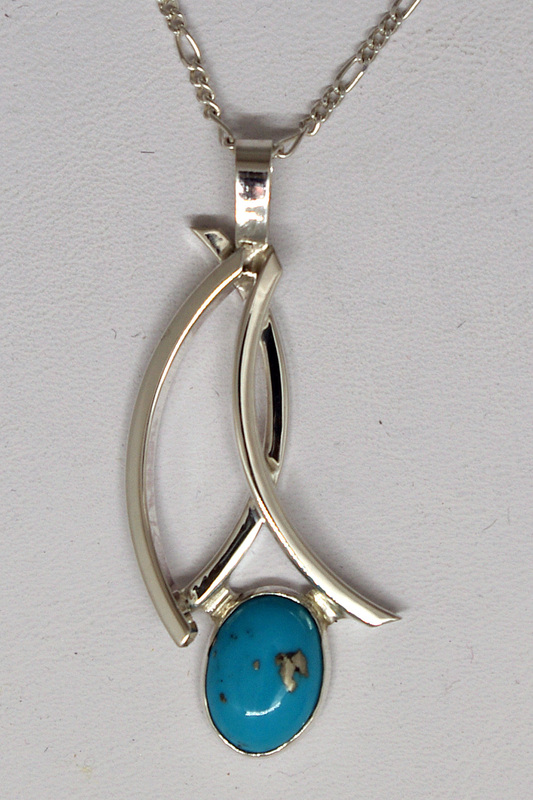 Curves Jewelry - This is a handmade asymmetrical sterling silver pendant accented by an oval (14 mm x 10 mm) blue turquoise cabochon. This beautiful petite One-of-a-Kind necklace comes with an 18" sterling silver Figaro chain. Handcrafted sterling silver one of a kind modern, assymetrical pendant (2" long x .75" wide) created from sterling silver tubing with a natural oval blue turquoise cabochon stone (14mm x 10mm). This beautiful pendant includes an 18" sterling silver Figaro chain. The bail on the pendant is 7mm long for chain versatility. Signed and created by Aaron Rubinstein and Modern Art Jewelry.